Everyone breathes. It’s something we often take for granted. However, it turns out that most of us don’t do it correctly. Chest or thoracic breathing is found in over 50 percent of adults, and it contributes to a number of problem. Incorrect or dysfunctional breathing patterns can play a large role in the onset of lower back, neck and shoulder and arm pain. Since the symptoms are varied in pattern and severity from person to person; they may be isolated in some individuals, or a combination of some, or all of them in others; dysfunctional breathing as a cause of pain, is unfortunately often initially overlooked. So, why are we finding more and more, that the apparently instinctive human physical action of breathing is not being performed correctly by so many people? Well it has a lot to do with our lives and the stresses that we are faced with today. The relationship between stress and breathing is an interesting one. Our natural response to stress is for our sympathetic nervous system to kick in to survival mode; “the fight or flight” response. This natural human instinctive response to danger or stress ensures our survival. While this has preserved our lives through the ages of hunting and gathering, it’s relevance to today’s stresses cannot not be underplayed. The stress stimuli in today’s life may have changed; such as work deadlines, exams, traffic jams, and financial worries, but they appear to be more constant, meaning our “fight or flight” sympathetic nervous systems is left in charge of many mental, emotional and physiological operations. While you can perform in this “emergency mode” for a short time, your capacity in this extreme is limited. Eventually, you will exhaust your physiological, psychological and even neurological resources and your health pays the price. Physical and psychological causes of breathing dysfunction can be hard to separate, and dysfunctional breathing can therefore not be simply defined. Whether the cause is postural, developmental, medical or emotional, the presentation is always very similar. So what are the signs of dysfunctional breathing patterns? 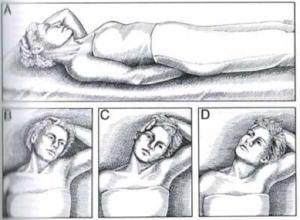 Lifting the collarbones, shoulders and upper thorax vertically with inspiration instead of “horizontally” pushing the lower abdomen and lower rib cage out during inhalation, and then drawing the abdomen back in during exhalation. With this vertical or paradoxical breathing, the ribcage is often stiff and held in an elevated position which externally rotates the ribs and pulls the diaphragm fibres from its normal dome shaped position, to a more straight and vertical position. 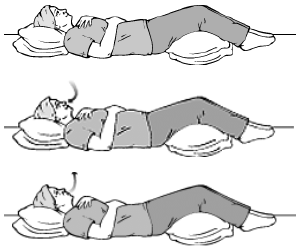 This position reduces the diaphragm’s contraction. Spontaneous flaring of the lower ribs is also often observed. The muscles around the neck, shoulders and mid thoracic; (including Scalenes*, SCM, upper trapezius and Pectoralis), are often tense and over-developed from the increased vertical movement of the ribcage and elevation of the shoulders during inspiration. The mid-lower back muscles are tight as they attempt to stabilize the spine in the absence of proper core stabilization. Every breath, involves a shoulder elevation and a back extension. The use of these accessory muscles as opposed to the diaphragm, expends more energy as a shallower breath is taken and over time chronic tension builds up around the neck, shoulders and chest. Take a moment to notice your breathing now. Put one hand on your chest just below your collarbone and the other hand on your belly. Now take a deep breath. How much of that movement in your ribcage came from your chest? How much from your belly? 80% of your movement should have come from your belly and 20% from your upper chest. Did you notice how far up your shoulders went? If you don’t have lungs in your shoulders, why are you using them to breathe? Ideal abdominal activity maintains the shape and pressure of the abdominal cavity sufficiently to make the action of the diaphragm more expansive on the lower ribs. There are many benefits of proper breathing. It has been found that people who practice deep breathing only ten minutes a day have better health and improved disposition. Here are 10 amazing benefits of deep, belly breathing. The body deals with a lot of toxins; everything from air pollution, to contaminated water, everyday foods and much more. Breathing is the body’s way of releasing those toxins and purifying its systems. When we don’t take deep breaths, the body is less efficient at releasing toxins. This makes the other systems in the body overloaded as they work to detoxify the blood, often leading to illnesses. When you inhale and exhale deeply, the body releases carbon dioxide, and along with it many toxins. Shallow breathing is linked to stress and anxiety. In fact, shallow breathing and anxiety disorders often go hand-in-hand. Shallow or constricted breathing occurs when we are in fight-or-flight mode, telling the body that we are unsafe. This results in anxiety, panic, and hyperventilation as the body prepares for danger. You can often see this dramatized in movies and TV shows when people begin breathing rapidly when they are panic-stricken. The key to alleviating anxiety and stress is to take deep breaths. It fills your body with oxygen, releases tension, and normalizes your heartbeat, creating a feeling of calm. If you suffer from anxiety or panic disorders, deep breathing can provide relief. The fastest way to feel calm in any situation is to breathe through the belly. Deep breathing benefitsour mental and emotional health because that’s how we’re meant to breathe in the natural state. When we take deep breaths, we stimulate the parasympathetic nervous system, triggering a relaxation response. No matter where you are or what you’re doing, just a few minutes of deep breathing will fill your body with oxygen and help you feel calm and relaxed. When we take deep breaths, more air is drawn into our lungs. Since the lungs help generate maximum blood flow, proper air supply to the lungs is critical. Improved oxygenation of the blood also results in an enhanced metabolism and greater energy. With the proper oxygen supply, all your organs are revitalized, filling you with more energy and vigor each day. Many of us don’t realize that deep breathing is a great exercise for the body. 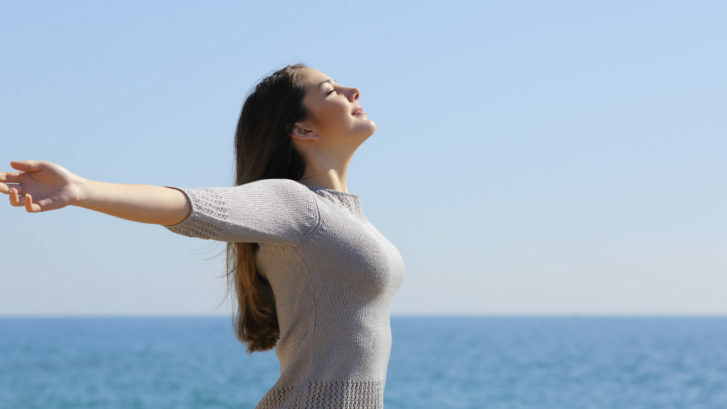 Even if you can’t regularly work out or have health restrictions that prevent you from exercising, you can still get the benefits of exercise simply by practicing deep breathing every day. Deep breathing enhances your cardiovascular capacity and burns fat easily. If deep breathing is practiced in addition to exercise, it may result in improved cardiovascular capacity. Another wonderful benefit of deep breathing is that it helps regulate weight. If you are underweight, proper breathing will supply the tissues and cells with more oxygen. If you are overweight, the oxygen will help burn extra fat on the body. When we take shallow breaths, the body ends up burning glycogen instead of fat. When we take deep breaths, it can help us remain relaxed and burn fat. The way we breathe affects the tone in our deep abdominal and pelvic floor muscles. The trunk is like a cylinder surrounded by muscles that should work together during breathing. Several studies have found that incorrect breathing and incorrect posture are directly related. When your posture isn’t correct, it can be difficult to engage in diaphragmatic breathing. When we deep breathe, it naturally makes us sit up straight or stand taller. This is because filling the lungs with air encourages a better posture. If you’ve never noticed it before, breathing deep will automatically straighten your spine. Shallow breathing combined with upper chest breathing means that the sympathetic nervous system is triggered, which is our stress response system. Conversely, deep breathing benefits your mood by increasing the production of neurochemicals in the brain, boosting feelings of pleasure and happiness. While shallow breathing can lead to stress and anxiety, deep breathing induces feelings of being happy and relaxed. When your lungs do not perform as well, your tissues, including your heart and brain, do not receive as much oxygenated blood. This can lead to shortness of breath, clouded thinking, and even heart and vascular disease. Have you noticed how your heartbeats slow down when you practice deep breathing? This is because deep breathing makes the lungs stronger and promotes oxygenation of the blood, reducing the load on the heart over time. While going for a brisk walk or run can naturally encourage us to take in more oxygen and breathe more deeply, there are some simple exercises that can be done to improve how we breathe so that we can benefit from all of the above, without even leaving the house. The muscles surrounding your trunk cylinder include your diaphragm (top of the cylinder), your deep abdominal muscles, wrapping around your trunk (the sides of the cylinder) and your pelvic floor muscles at the base of this cylinder. There are a number of exercises and stretches that should be attempted (within pain limits) for the specific muscles involved. Find a quiet, comfortable place. If neither of these are available, get as comfortable as possible. Lie down, sit or stand. The less work your body and brain have to do to keep you upright and alert, the better. Close your eyes. Humans are highly responsive to visual stimuli. Closing your eyes cuts out distraction. Place a hand just above your navel and one on the centre of your chest. Close your mouth. Breathing through the nose warms, moistens and cleans air before it hits the sensitive tissue in your lungs, and it stimulates the parasympathetic nervous system. Begin by taking a deep breath in through your nose. Attempt to breathe in for a 4-count. The exact count is not important initially; it is merely a metric to reinforce breath control. As you breathe in, focus on your belly expanding against your hand. 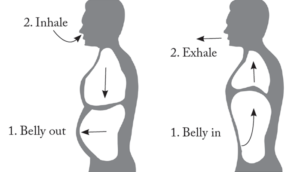 Belly breathing enables your diaphragm to fully fill your lungs with air. Your chest should rise only slightly, and only after the belly has fully expanded. Be conscious to keep the shoulders relaxed and do no allow them to rise, and keep the head and neck relaxed throughout. Breathe out through either the nose or the mouth for another 4-count. Continue this breathing tempo and depth for 60 seconds. Attempt to focus primarily on the sound of air coming into your nose and out through your mouth or nose. After this 60-second exercise, take note of how you feel. How do you feel physically, mentally and emotionally? Would feeling like this more often be a benefit to you? If so, just think how just 60 seconds has actually altered your physical and mental state. Mindful breathing techniques can help you develop greater conscious control over your natural stress response.Your parasympathetic nervous system, which is involved with “rest and digest” processes in your body, responds to this slow, controlled, mindful breathing. A very important muscle in your neck and chest. 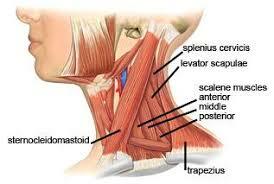 The scalene muscles are a pair of muscles located in the front of your neck on either side down to your first two ribs. Each side is divided into three separate sections that each perform lightly different actions. The scalenes can become tight from stress. When we become stressed, we stop breathing from our bellies like we did as babies or when we sleep. Our chest tightens and our ribs stop moving down and out. The scalenes come to the rescue by helping lift our ribs to get more air in our lungs. 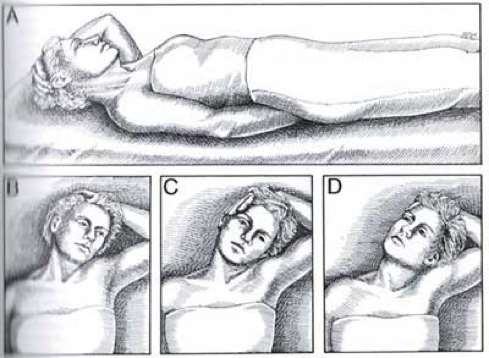 By doing this chronically, our scalenes become tight and keep our chest lifted permanently leading to a tight, uncomfortable neck and chest. Another way the scalenes can become tight is from bad posture. Of course, we all assume our posture can be better, and this is probably true. Slumping at our desks or computers will cause upper cross syndrome (shoulders rolled forward, forward head carriage, tight and weak upper back, tight and weak chest). When the scalenes are tight, they flex the head forward, and this is hard on the neck. Just like when you hold a heavy object in your hands, holding that object closer to the body is easier that holding it far away from the body. You head becomes much heavier – about 30 lbs heavier (see image below). Imagine what that does to your spine? This can lead to degeneration in your vertebrae and arthritis in your neck. When the head slips forward, it also changes the orientation of your jaw and can cause headaches, TMJ issues, and neck pain. Stretching the scalenes is relatively easy. Start by sitting in a chair. Put your right hand under your bottom and sit on it. This pins the shoulder down so that your neck can stretch without raising the shoulder. Tilt your head directly to the left bringing your left ear towards your left shoulder. If you don’t feel much of a stretch, bring your left hand up to LIGHTLY pull your head down towards the left more. Hold for 10 breaths. Repeat this stretch tilting the head slightly in front of and behind the shoulder as well. This stretch can also be done lying down. Should you find that these self help techniques are not enough to resolve your soft tissue tightness, a visit to your Sports Therapist is advisable. Postural assessments and muscle testing can be performed to help further identify areas of tightness, imbalance, overactivity or inactivity of muscles, and manual therapy techniques will be used to address them.